Green Baby Elephant has a 6 pack deal on Knickernappies' 100% Unbleached Indian Cotton Prefolds available in all three sizes (Infant, Premium Short and Premium). Prefolds are an excellent cloth diaper option when you're on a tight budget or when cloth diapering a newborn. Did someone say FREE SHIPPING? Going on now at Happy Baby Company, any time your total purchase is over $35 you receive shipping for free! Happy Baby Company sells Knickernappies' Baltic Amber Teething Necklaces, One Size Diaper, Baby Bum Drops, pregnancy test strips and Stay Dry Nursing Pads. 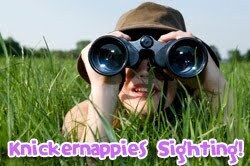 Comfy Cozy Diapers has Knickernappies 1G Pocket Diapers on sale for $10.50 (retail price $15.95)! Hurry these puppies are selling out fast! If you're looking for a new nighttime diapering solution check out Tales from the Nursery's review of our One Size Pocket Diaper and Loopydo Inserts. Darcy's, the mama behind Tales from the Nursery, little girl is a heavy wetter so finding a nighttime solution was something she really needed to do.